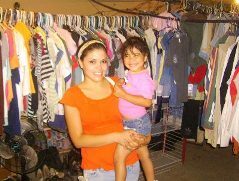 Maria Rosa Garcia sells new and used clothing. in Nogales, Mexico She buys clothing in US and resells in Mexico. She tries to buy seasonal items that will sell well and quickly. Her goal is to turn her inventory monthly. She has been in this business for four years. She borrowed 2,500 pesos (about US$200) initially and now up borrows to 5,000 pesos (US$415) which is her own self imposed limit. She is approved by EnComun (a charitable micro-finance organization supported by ProMex Group) for 10,000 pesos (US$830). She has been very pleased with the loan process and interest rates. Her markup is usually about 100%. She sells the clothing from home for cash but has a few clients who she allows to purchase on credit. She has three children and husband. Her husband works and his income pays the house and utilities. Her earnings buy the children clothes, shoes, school fees, food and home improvements.